End of Year Awards that include 35 cute animal awards that each have their own unique animal puns. 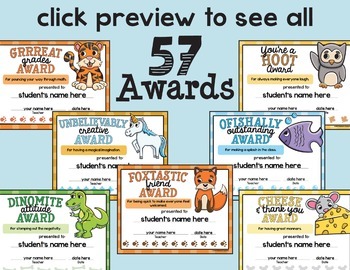 Younger students will love these classroom awards! 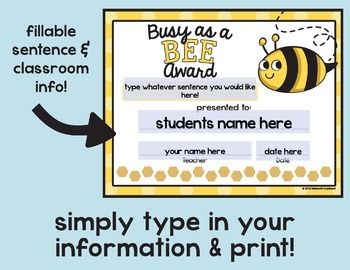 Teachers will love the variety of awards to choose from and the editable fill-in blanks. Also included in the End of Year Awards Unit are 22 miscellaneous and academic awards. - Editable fill-in-the-blank lines for student's name, teacher's name and date. - One of a kind award that allow students to have their own unique animal to celebrate their achievements with. 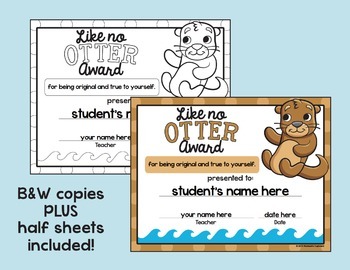 These certificates were created for younger elementary. 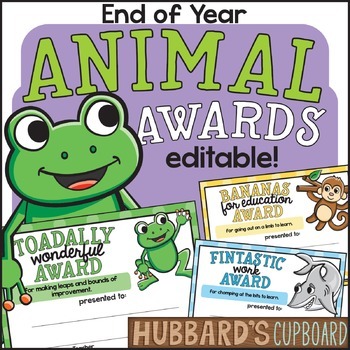 We wanted to create end of year awards that they could relate to and animals are always a favorite of the younger grades. Along with each certificate being unique, they are editable. Each award has a place to type in the student’s name, teacher’s name, and date. What makes these even better is that the pun that goes with each animal certificate can be edited to fit each individual student. Nothing touches a student more than knowing that an End of the Year award was specifically chosen for him/her. check out our other end of year awards! Also included are in this End of Year generic/academic certificates that can be edited to award students in certain subjects. They are colorful and have editable blanks for the teacher or student’s name along with the date. • Editable - Fill in blanks for student/teacher names and date.